Anyone, who in a proactive manner at work. 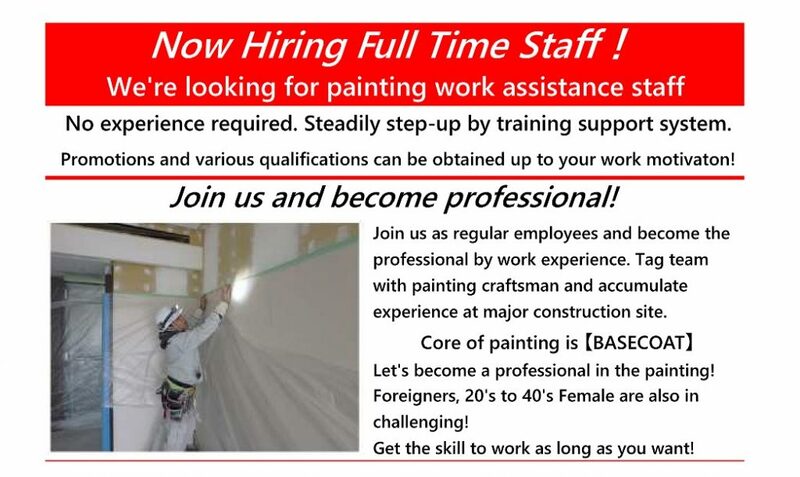 Work with painted craftsman at construction site such as detached residence, mansion etc. Prepare for construction painting such as curing for prevention of extrusion or scratch, surfaces preparing, sheet pasting, sandpaper polishing, cleaning etc. Anyone, who living in japan. No experience required. Provide consultation for working hours, and working details etc. ※Instructor allowance will up to the number of working days. Employment staffs in KANSAI area have no relocation. can request for working area after 3-5 years technical training is over. Aug, 2017 Fukushima, Hiroshima, Chugoku office open ! To being the top technician, in addition of internal company training, manufacturing process training by Fuji education training center and manufacturer, we have our own original training program to get a qualification in 3 years. Thank you in advance for your understanding and cooperation, and we hope we can help you all find positions you enjoy! (C) 2015 KMUnited. All Rights Reserved.